New study published in ANTICANCER RESEARCH Journal offers potential proof-of-concept for precision medicine approach to cancer treatment. SAN DIEGO, CA – April 12, 2018: A new in vitro cancer study supports the concept of matched combination therapies as more effective treatment when compared to matched monotherapies or the current standard of care. Among the most frequently used anticancer drugs, of which there are around 300, very few combinations have actually been explored in clinical trials. Thus, experimental validation of combination therapies simultaneously targeting several mutated genes is an important step in the progression of the field. The study explored the effects of a combinatorial therapy on cancer cell lines bearing specific mutational profiles in pancreatic cancer, specifically ductal adenocarcinoma (PDAC), the fourth most common cause of cancer-related death. The current standard treatment for advanced PDAC has not shown a significantly improved survival rate in over four decades, clearly indicating the need to develop new treatments for this disease. Recent advances in genomics analysis, the quantification and characterization of genes which direct the production of proteins (molecules that do most of the work in cells), now allows for the selection of anti-cancer drugs specifically matched to genomic alterations found in a patient’s cancer. The study focused on a PDAC cell line, CAPAN2, originating from a human pancreatic adenocarcinoma primary tumor. In this cell line, there are specific functionally altering mutations in the proteins, ABL1 (a tyrosine kinase involved in the regulation a number of cellular processes) and KRAS (a small GTPase which is part of RAS/MAPK signaling pathway). The study shows that drugs, regorafenib (RTK inhibitor) and trametinib (MEK inhibitor), individually and in combination, significantly reduced the proliferation of these pancreatic cancer cells in vitro. More significantly, combinations of these two anti-cancer drugs were found to have synergistic effects. In general, if a drug pair/combination improves the inhibitory potency relative to that of each drug alone, the combination is considered synergistic; if potency remains unchanged, the effect is considered additive; and if potency is reduced, the effect is considered antagonistic. The study showed that trametinib and regorafenib combined in specific ratios of concentrations were found to lead to increased cancer cell death at much lower concentrations than either of the drugs in monotherapy. 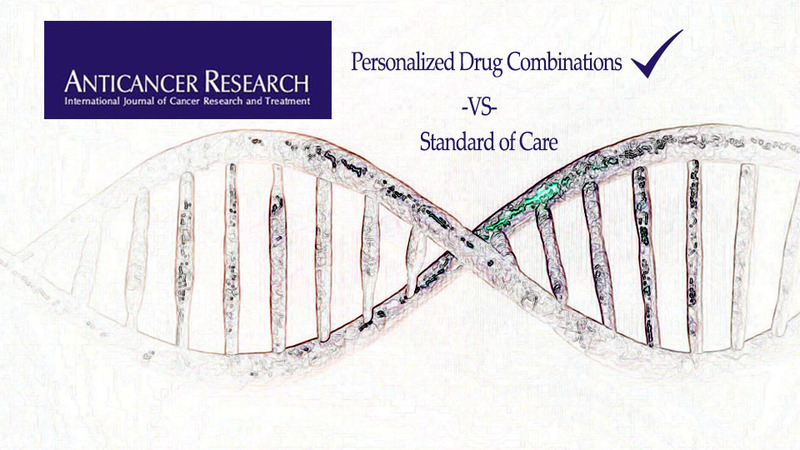 Personalized combination therapy is rapidly becoming a highly promising option for the treatment of cancer. It is believed that combinations of anti-cancer therapies matched to the actionable cancer genomic profile of a patient would likely result in better response. However, due to limited experimental justification for the use of personalized combination therapy, most cancer patients are still routinely treated with the so-called standard of care which does not typically take into account genetic aberrations found in cancer. This is particularly unfortunate given the recent explosion of genomic research as well as drug design and development. Researchers and clinicians have the unique opportunity to treat cancer as a truly personal disease. Intelligent computing systems can streamline the daunting task of selecting the most promising combinations of anticancer drugs for each patient. CureMatch® is a digital precision oncology company bridging the gap between legacy cancer treatments and advances in personalized medicine. In PreciGENE reports, CureMatch scores and ranks Personalized Combination Therapy® options to target specific molecular aberrations and improve the precision of cancer treatment recommendations. The study, “In Vitro Elucidation of Drug Combination Synergy in Treatment of Pancreatic Ductal Adenocarcinoma” in ANTICANCER RESEARCH1 is authored by Kevin T. Bush, Ph.D., Amelie Boichard, Ph.D., and Igor F. Tsigelny, Ph.D.
1 CureMatch Inc., San Diego, CA, U.S.A.; 2 Department of Pediatrics, University of California San Diego, La Jolla, CA, U.S.A.; 3 Center for Personalized Cancer Therapy, University of California San Diego, Moores Cancer Center, La Jolla, CA, U.S.A.; 4 Super-Computer Center San Diego, La Jolla, CA, U.S.A.
ANTICANCER RESEARCH is an independent international peer-reviewed journal devoted to the rapid publication of high quality original articles and reviews on all aspects of experimental and clinical oncology. ANTICANCER RESEARCH was established in 1981 and is published monthly.